Our bakery and café in Marble Arch is located at 32 Edgware Road, between Connaught Street and Seymour Street, a few minutes’ walk from Marble Arch tube station, Hyde Park, Selfridge’s, the flagship Marks & Spencer store and all the other retail delights of Oxford Street, Bond Street and the surrounding area. It’s the perfect place to enjoy a delicious Parisian breakfast before heading to the shops. 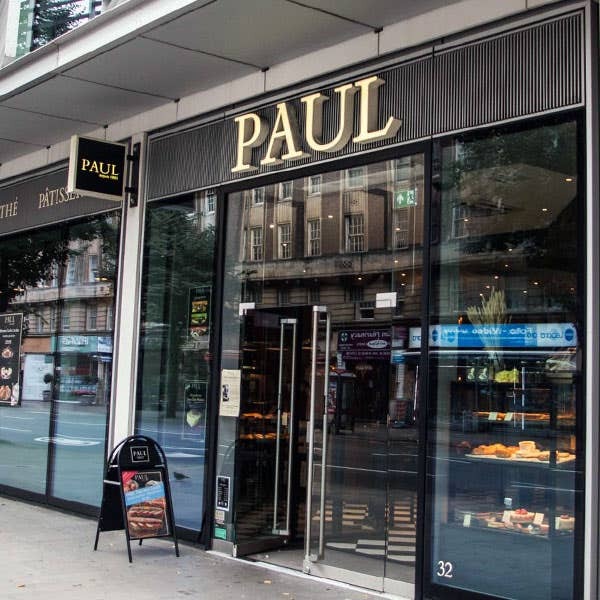 We also offer a cooked breakfast/brunch menu, 7 days a week until midday, with a range of delicious traditional egg dishes, freshly prepared and accompanied by PAUL bread. Have a break for lunch or a sweet treat and coffee, or pop in and buy yourself a picnic to enjoy in Hyde Park on a lovely summer’s day. The Marble Arch after which the area is named was designed by John Nash and originally erected in 1827 in front of Buckingham Palace. It was moved to its current location in 1851. In case you were thinking of trying to drive through it, please note that only senior members of the Royal Family and the King’s Troop Royal Horse Artillery are permitted to do so! Our closest station is Marble Arch (Central Line). 40 seats are available. Disabled access available. Free wi-fi.